Stewardship is the responsibility for taking care of resources entrusted to us. At St. James, we are being good stewards by taking care of each other and our neighbors through financial support of our church family. Additionally, we are good stewards by giving of our time, talent and energy to the many ministry opportunities offered at and through St. James. We are all asked to give back joyfully to God in thanksgiving for the abundance God has given us. Every household should base their financial pledge upon a percent of income. 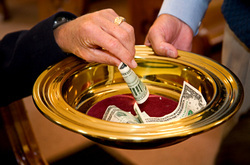 Tithing (giving the first tenth or 10%) is a holy habit that should be the practice or goal. By establishing a goal, one can use increases in proportional giving to grow into this holy habit. Just as we grow in faith, we continually strive for growth in our stewardship response to meet this standard of giving.